The Kuhn PZ 170 drum mower, with a 5'5" cutting width, is new to the Kuhn lineup of mowers in North America. This drum mower is a reliable and economical alternative for small to medium-sized farms. 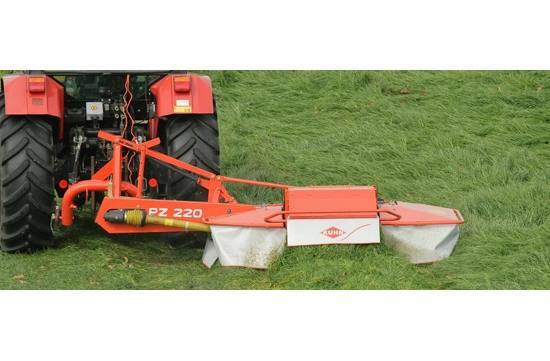 The PZ 170 is a simple and dependable option for mowing fields or cutting hay, with minimal horsepower requirement. This model is equipped with two flat-sided drums for optimal crop transport, to help eliminate blockage. To further enhance crop throughput, Kuhn utilizes bolt-on transport strips. Rotating skids also work to reduce crop contamination by rotating over the ground rather than sliding in uneven conditions, while protecting the stubble and turf. In addition, a standard flotation spring reduces the weight of the mower unit on the ground to improve mower flotation and terrain following. The quick-change blade system ensures trouble-free blade change in seconds, by using a special tool provided with the machine. If an obstacle is encountered when mowing, the safety breakaway system is automatically activated.